A new sub: USS Mass. The sailors and Marines who met in battle near the Madeira Islands two centuries ago never knew that the War of 1812 was already over. The United States and the Britain had signed a peace treaty in Ghent a few weeks earlier, formally ending hostilities. But even news of that magnitude took time to spread around the globe. So when Captain Charles Stewart aboard the USS Constitution caught a glimpse of the British-flagged ships Cyane and Levant, he promptly gave chase, attacked, and seized the two vessels. That slugfest was the final engagement for Old Ironsides, and it capped an impressive 33-0 record. Little wonder that the crew of the frigate in Charlestown Navy Yard likes to boast that their ship is Boston’s only undefeated sports team. To be sure, future sea fights will differ sharply from the Constitution’s dual victory over Cyane and Levant. No longer do iron men and wooden ships batter away at one another from close range. Time and technology have moved on. Sail gave way long ago to steam, and ultimately diesel, nuclear, and gas-turbine propulsion. Smoothbore cannon like the Constitution’s were superseded by rifled guns and, eventually, torpedoes, sea mines, and guided cruise and ballistic missiles. All the same, the Constitution’s War of 1812 Rumble in the Atlantic hints at our Navy’s future in three intriguing — and unsettling — ways. It provides insight into the menace of land-based sea power; the importance of long-range weaponry; and the indispensability of old-fashioned seamanship, tactical wizardry, and derring-do. How well the US Navy fares along these material and human axes will determine whether American fleets survive and win in increasingly contested oceans. First of all, sea power is no longer all about fleets. Armies and air forces are arms of sea power as well. Land-based weaponry — warplanes, antiship missiles, short-range submarines, and patrol craft — can increasingly shape events far offshore. Since the Navy operates off foreign coasts, these are menaces it will confront. The Constitution, the Cyane, and the Levant joined in battle on the open ocean — far from their main fleets and remote from shore. They were on their own. Communications technology remained rudimentary at best, meaning that neither American nor British commanders could summon reinforcements. Old Ironsides’ last combat, then, was compact and self-contained. Few 21st-century oceanic battlegrounds will be so tidy. Do a little thought experiment. Madeira sits just over 300 miles off the African coast. What if the Royal Navy had emplaced guns along that shoreline that were capable of raining accurate fire on ships sailing, say, 500 miles out to sea? British gunners could have pelted the American vessel. The Constitution’s perfect record may have suffered a blemish had the frigate squared off not just against the Cyane and the Levant, but against artillery blazing away from afar. Fire support can shift the balance in favor of even an outmatched contender. This is no thought experiment for today’s Navy. Task forces of ships must operate off distant shores — chiefly Eurasian shores — to accomplish the goals entrusted to them by presidents and Cabinet officials. To strike targets on enemy shores, for instance, an aircraft-carrier task force must draw to within about 700 miles of those targets. That’s the combat range of the F-35C stealth fighter, the workhorse jet of 2025. And the farther inland the target, the closer the carrier has to get. Cruising close to land also means dangers from an enemy fleet. 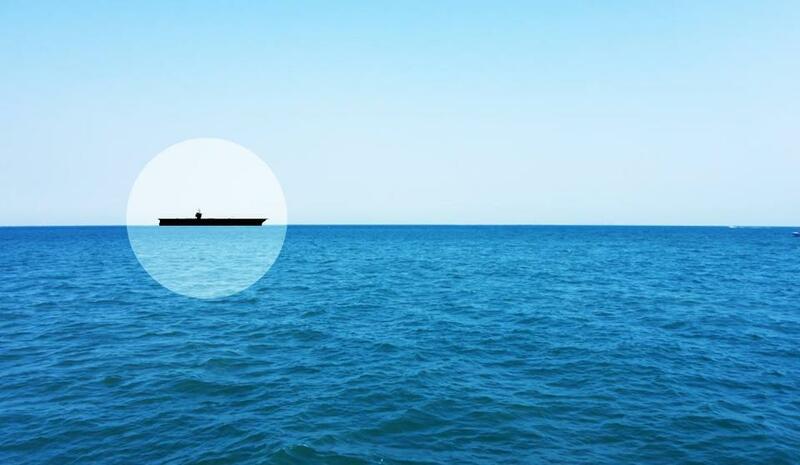 The descendants of the Cyane and the Levant — cruisers or destroyers roaming the surface, or subs prowling the deep — comprise the most obvious threat. But gee-whiz missile technology compounds that threat. Take China. In September, China’s military staged a massive military parade through Beijing. On display, alongside other armaments, were two new types of antiship missiles. These revolutionary weapons, the world’s first, can reportedly hit moving ships at sea far from Asian shorelines — at least 900 and at least 1,800 miles away, respectively. (A missile based in Boston, for instance, could hit a moving ship off the coast of Greenland.) China’s army, meanwhile, not its navy, operates this ballistic-missile force. What that means in practical terms is this: Until the US Navy builds effective defenses, commanders can choose to stay beyond missile range and see their missions fail. They can cross hundreds of miles of ocean under fire from Fortress China and suffer serious damage. Or they can accept a prolonged war in which time is on China’s side — say, if Beijing orders a lightning assault against nearby Taiwan. Taiwan might fall before US forces could break into the Western Pacific. Couple the missile threat with that posed by other shore-based antiaccess weaponry like missile-armed warplanes, and you have a forbidding tactical problem indeed. Engineers are pursuing remedies to the antiaccess quandary. Prototypes of shipboard lasers and electromagnetic railguns already exist, for instance. These might help American ships ride out enemy attacks. Lasers could play havoc with enemy arsenals, and railguns could sling projectiles over 100 miles at Mach 7 — taking down incoming projectiles. Heartening stuff. But such exotic armaments are years from being ready for prime time. Moreover, US mariners and aviators find themselves outranged by competitors’ weaponry — even apart from the antiaccess problem. Captain Stewart enjoyed a tactical trump card over his nemeses: the long reach of Old Ironsides’ guns relative to British ships’. The Cyane and the Levant packed serious heat in the form of “carronades” — shipkillers that flung massive projectiles — but they had to get within 400 yards to fire them for lethal effect. The Constitution’s guns, by contrast, could snipe away at enemies from 1,200 yards. In sea warfare as in boxing, an advantage — a hefty one — goes to the pugilist with longer reach. Now flip that around and assume the US Navy’s adversaries hold the edge in long-distance strikes. As indeed they do. In a sense, the Navy took a quarter-century-long strategic holiday following the Cold War. The Soviet Navy’s demise removed America’s chief rival from the world’s waterways. Why go to the trouble and expense of developing new armaments to fight nonexistent foes? And indeed, such reasoning seemed to hold sway. Sea-service leaders proclaimed that there was no one left to fight for command of the sea, the primary purpose of any navy. They turned their attention to projecting power from safe waters. They concentrated on refining land-attack weapons, while new weapons for dueling enemy ships languished. For example, the surface Navy’s workhorse Harpoon antiship missile entered service in the 1970s. Harpoons can strike at shipping roughly 77 miles distant. Contrast that with the Soviet-built Sunburn missile, one found in the Chinese and Russian naval arsenals. The Sunburn has a range estimated at double the Harpoon’s, or 155 miles. That means enemies can start shooting — and meting out damage — long before our ships can. American ships and crews may be superior to their opponents, but that may not matter if enemy fleets and air forces can unleash massed missile barrages. So defense firms are hastily developing a new long-range antiship missiles, which could restore American dominance. Whether they mature in the next decade — and whether the new missiles can be fielded in adequate numbers — will furnish a second yardstick for US naval fortunes. As ever, the future of the Navy also depends on the human factor. Stewart maneuvered the Constitution deftly to avoid being raked across the frigate’s bow and stern, where wooden warships were most vulnerable. Instead he crossed ahead of and behind his opponents, raking them from before and aft. At one point in the engagement, furthermore, he ordered the Constitution’s topsails “taken aback.” Turning the sails into the wind, an unorthodox move, stopped the ship in a hurry — keeping the Levant from crossing astern and blasting away from a position of advantage. Instead Stewart kept the upper hand. Indeed, the skipper’s stratagem foreshadowed the scene in “Top Gun” in which Maverick hits the air brakes so a Soviet MiG flies “right by” and appears in Mav’s gunsight. Quick thinking, skill, boldness: These are determinants of competitive endeavors of all sorts. There’s no reason to think today’s naval mariners are less stalwart than their forebears from the age of sail, but the skills and habits of mind needed to prevail in high-seas combat have atrophied since the Cold War. Why wouldn’t they? For instance, with no Soviet submarines to hunt, crews seldom practice the difficult yet crucial art of antisubmarine warfare. Or, many of the surface fleet’s latest guided-missile destroyers carry no antiship missiles for battling enemy surface fleets. Their crews, consequently, have little practice using their principal weaponry in action. Combat is a poor time for learning basic skills. Or heck, navigators have grown dependent on GPS to steer their ships safely. Celestial navigation — using the stars to plot a vessel’s position on the chart — was a time-honored method for finding one’s way from point A to point B until the 1990s. In this satellite age, however, a black box spits out the ship’s current position. Which is fine until some enterprising opponent does the obvious thing and knocks out the satellites — leaving US naval forces floundering. Just this year, the Navy announced that it will resume training youngsters to steer by the stars. Charles Stewart would be appalled to hear it ever stopped. Why? Because ’60s youth “sought nothing less than to sweep aside all codes and restraints of the past and start out from zero.” They rejected timeless precepts — including basic hygiene. The hippies had to either put up with the rot or relearn common sense. Similarly the Navy tried to start from zero in the early 1990s. The leadership declared fighting for control of the sea — navies’ uppermost mission — passé. They made the Navy into the Haight-Ashbury of sea combat, a force that forgot eternal verities. The US Navy’s great relearning must proceed — quickly — to assure its fitness for battle a decade hence. Charting this dimension of naval warfare is harder than the others. Judging the human factor is harder than gauging widgets. Short of wartime, evaluating combat readiness involves evaluating the type, amount, and quality of technical training provided to officers and enlisted sailors; the education in strategy, politics, economics, and other disciplines that senior personnel undergo as they ascend the ranks; and the types, scope, and ambition of the maneuvers the Navy conducts to ready itself for battle. That’s a subjective process, but there’s no escaping it. After all, the finest weapon is no better than the seafarer wielding it. If the US Navy measures up to likely antagonists in hardware terms, the skill and élan of aviators, surface-ship crews, and submariners will make the difference when it matters, just as it did 200 years ago on the high seas of the Atlantic. James Holmes is a professor of strategy at the Naval War College and a graduate of the Fletcher School of Law and Diplomacy at Tufts University. The views voiced here are his alone.